Cherish a silver bar gleaming with Chinese zodiac inspiration in the NEW PAMP 2018 100-Gram Silver Lunar Year of the Dog Proof. Click to GovMint.com. Who Let the Dogs Out? 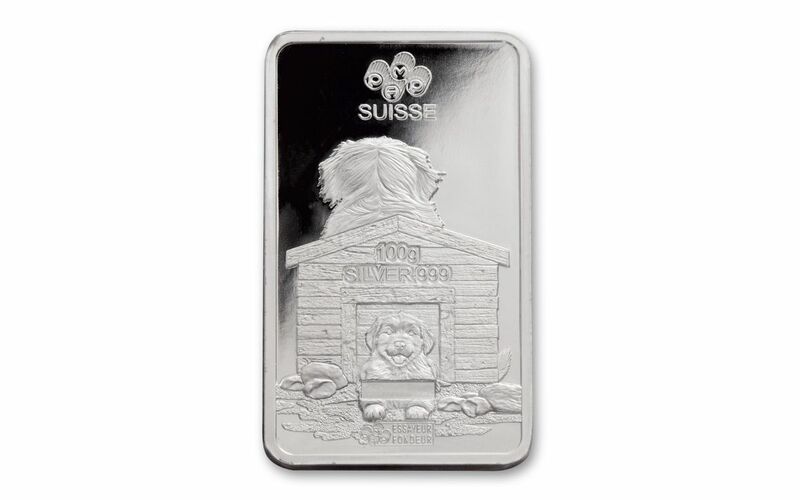 The Swiss, That's Who, In a Fine Silver Proof! You may find yourself humming the popular '70s tune, Year of the Cat, but it's this Year of the Dog proof that's become sweet music to our ears! This fine specimen of silver celebrates the lunar calendar's Year of the Dog, a date that only comes around once every 12 years. A beautiful addition to any collection, this PAMP 100-Gram. Silver Lunar Year of the Dog Proof celebrates those born in years 1934, 1946, 1958, 1970, 1982, 1994, 2006 and 2018. In the Chinese zodiac, the dog symbolizes loyalty, compatibility and kindness. Collectors interested in starting a zodiac-inspired series will cherish this bar proof with man's best friend -- it certainly wins our best in show! The Chinese zodiac is an ancient calendar that relates an animal to each year, 2018's being a dog, radiantly depicted on this proof that's definitely barking up the right tree! So, let your fingers do the shopping and add it to your cart right now. With the popularity of fine silver bars, we wouldn’t want you to miss out. Click Add to Cart now! STRUCK IN 99.9% FINE SILVER - This isn't your normal bar. Struck in 100 grams of pure 99.9% fine silver, each Year of the Dog Proof is expertly minted with the latest in minting technology. The result is this shimmering proof-grade ingot, measuring 35 x 60 millimeters with an individual serial number and packaging complete with Assayer's signature. This isn't just any bar, it's a grand champion! 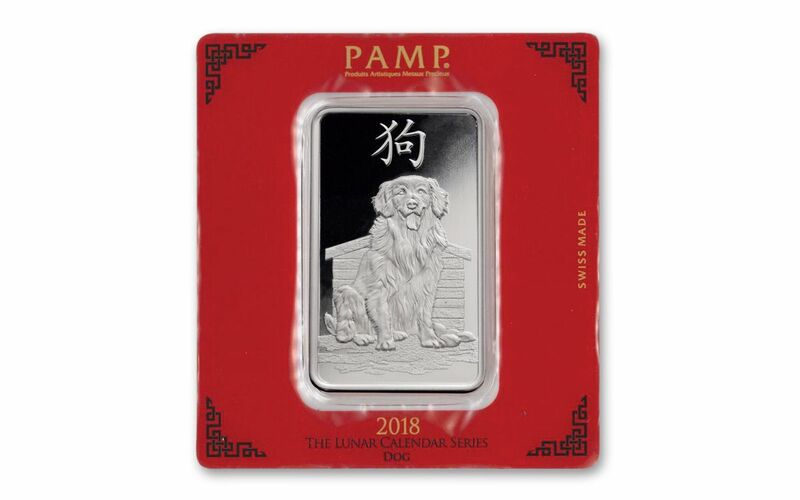 A GOOD FORTUNE PROOF - This 100-gram proof of silver captures the Lunar Calendar's Year of the Dog and is part of a Chinese tradition of giving a gift of good fortune. The obverse depicts a precious pooch (we think a golden retriever) sitting in front of a dog house, with the Chinese symbol for "dog" overhead. The reverse features the back of the dog house with a cuddly surprise: an adorable pup inside! The reverse's engravings include PAMP SUISSE, 100g SILVER .999, the unique serial number and ESSAYEUR FONDEUR. PAMP SUISSE - Located in Switzerland, PAMP stands for Products Artistiques Métaux Précieux, or Artistic Precious Metals Products. Famous for their highly pure ingots and cast bars, PAMP Suisse's masterful refining and minting of precious metals is recognized as among the world's most elite. With that said, this bar is a prized piece and gets four paws up! SPECTACULAR, HIGH-RELIEF PROOF - Each shimmering proof-condition bar begins with hand-selected 99.9% pure silver. These Year of the Dog proofs are struck numerous times with polished dies resulting in bars that are -- dare we say -- a paw above the rest! The lustrous fields and impeccable details are simply stunning and ONLY found in proof-quality ingots. These bars are minted primarily for collectors and not released for general circulation. They are another example of how PAMP has earned a reputation for beautiful, sought-after bars. SPECIAL PACKAGING - Your bar ingot will come secured in a PAMP Suisse assay card that reflects the serial number, fineness and weight of each bar. Sealed in CERTIPAMP packaging. With so many collectors interested in Chinese zodiac-inspired proofs, please don't wait long to secure one of these for yourself. 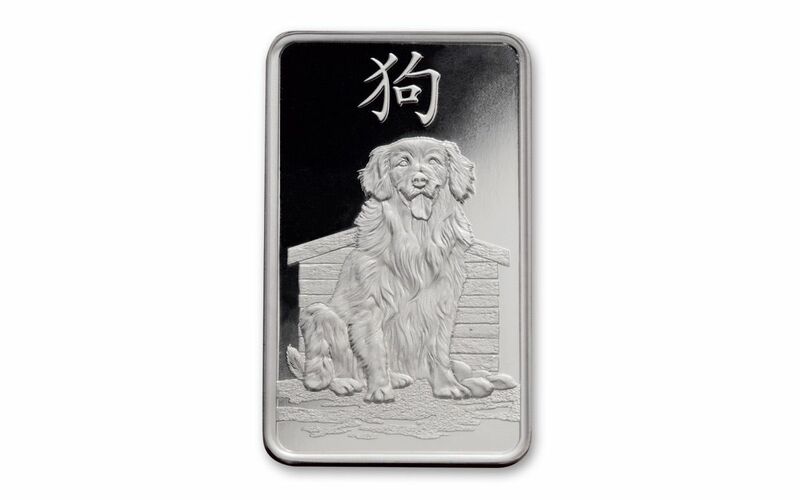 Be sure to order your ingot commemorating the Year of the Dog today. Then, look for the other proofs in the Lunar calendar series to expand your collection, right here at GovMint.com. 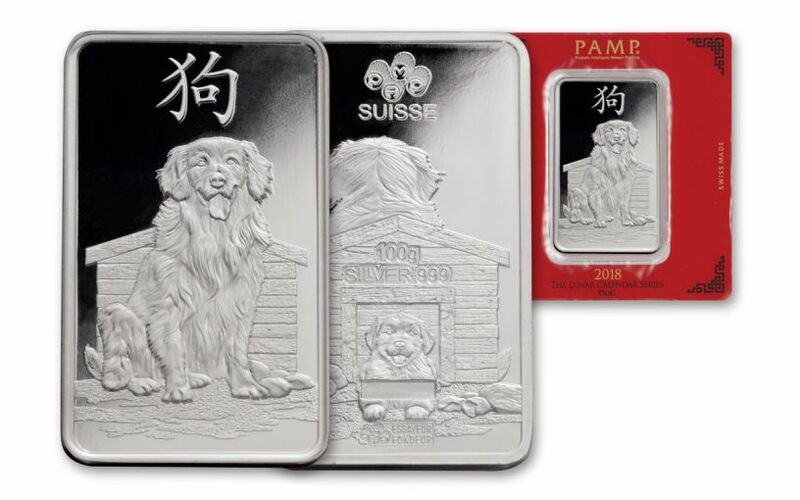 Add this 2018 PAMP Suisse 100-Gram Silver Year of the Dog Bar to your GovMint.com cart today. It's truly a paw above the rest and one you simply must have! Order one or a full litter at GovMint.com today.